So here's some Work in Progress X-Men, some having slight mods, others a bit more ambitious, none of them really completely done yet except Angel. this is amazing, cant wait to see some close ups! Very nice! I agree with Engineerio, we need some closeups! Great work man! Is that Gambit I see or am I just wearing Gambit beer goggles? Ok, everyone's favorite Ragin' Cajun. 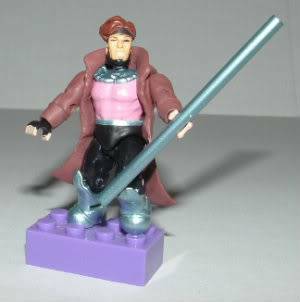 Remy Lebeau - Gambit! (Yep Emerald, your beer goggles aren't fooling you)! Fully removable coat and swappable arms... I like him much better with the coat on... still pondering how to make energized cards effect. yes. Yes!! YES!!! LOVING the sculpts here. I need that coat. Is it the lizards. I love gambits smirky grin! Looking forward to seeing the finished Beast. Thanks, Emerald! The coat, alas, isn't from the Lizard. I made it up from a DCU Infinite Heroes Black Canary vest by adding layered electrical tape and 5 minute epoxying it on (you can see the glue seam just below the waist). That makes the coat even better. Great parts sourcing right there. I may have to try something similar. Wow, knowing that you did all that to make the coat work makes it that much cooler! Great job! Phoenixrising wrote: Thanks, Emerald! The coat, alas, isn't from the Lizard. I made it up from a DCU Infinite Heroes Black Canary vest by adding layered electrical tape and 5 minute epoxying it on (you can see the glue seam just below the waist). 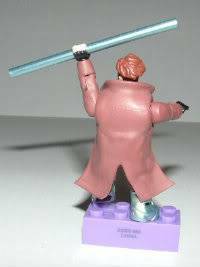 Great minds think alike - my Gambit coat came from the same source, but I built it up from putty. Your Beast head is great. Love the open mouthed snarl! Awesome stuff here for sure. Love the paint job on gambit. Flawless victory. Muchas Gracias for the great comments! If you guys like, I can temporaily donate most all of the heads I've used for some Asphalt and Deadrock "magic"... so we can all partake in the fun. Hand drawing that X symbol wasn't as easy as I thought it would be. I think I'll do it again...Anyone have a template maker suggestion that can print on slide off decal? That X looks fantastic! Don't know why you'd want to redo it. He looks great, fantastic parts usage and man, I love that face! 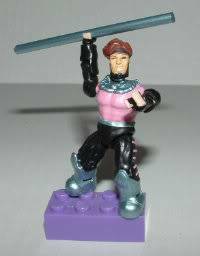 Not new, but I like him as part of the X-Men... Cyclops almost done as well as Wolverine. Pretty much choosing my favorite rendition of each character. Being the frugal type, I'm attempting to make my own photo tent 'cause I can barely stand the flash effects and shadows anymore. We'll see if it works out, if not, I'll shuck out the bucks and get one off eBay. I know the feeling. 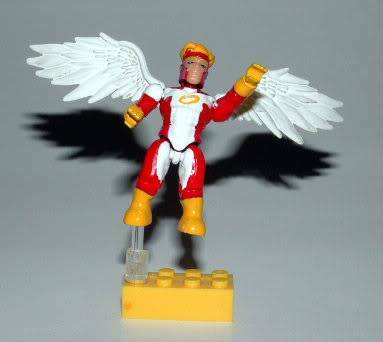 Back when I was doing more customs, I really wanted one, but never got around to it. In fact, I have a tripod somewhere that i bought for stop motion work... Now where the hell did that go? Bro, you know you can make one with a cardboard box and a few scraps of white sheet fabric? A light box is about the easiest custom accessory to assemble. I love these X-Men! Now I guess I have to make some to go with my Colossus. Great work! 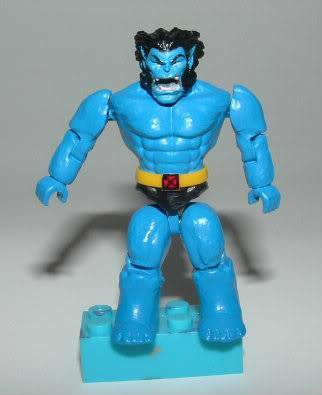 good idea repainting cyclops there.. i can't recall where or when is that suit mega used. Oh and angel and the beast... now all we need is a Jean. 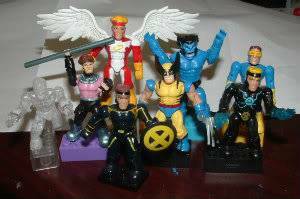 The Beast, Angel and Gambit you've got here are great additions to the X-Men line. The paint looks pretty vibrant and crisp on all of them. Can't wait to see the rest. I'm expecially pumped for the close-ups of Wolvie's mask though. I was planning on doing something similar to that, myself. Two questions. What head did you use for your Gambit and who's the guy in the front? 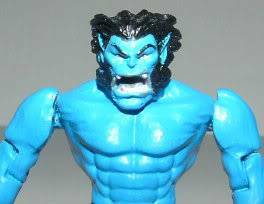 Is that a custom sculpt or a sourced head on Beast? Not asking for source, just curious if it's your work.